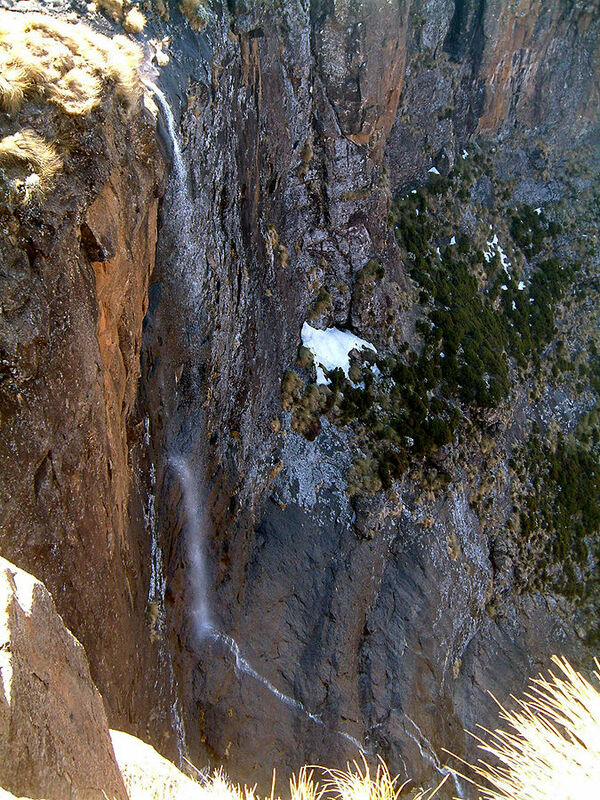 The falls is extremely high but to be frank, it is not among the strongest waterfalls. The water that collects on the rather flat surface of Mont Aux Sources flows mostly either west or north. Only a small portion of the water flows east, and this accounts for several very tall, but meager waterfalls, Tugela being the largest. It is really only after the rain periods, when Tugela flows well. But when it does flow, it is really impressive. In the dry summer months, don´t count flow to exist. 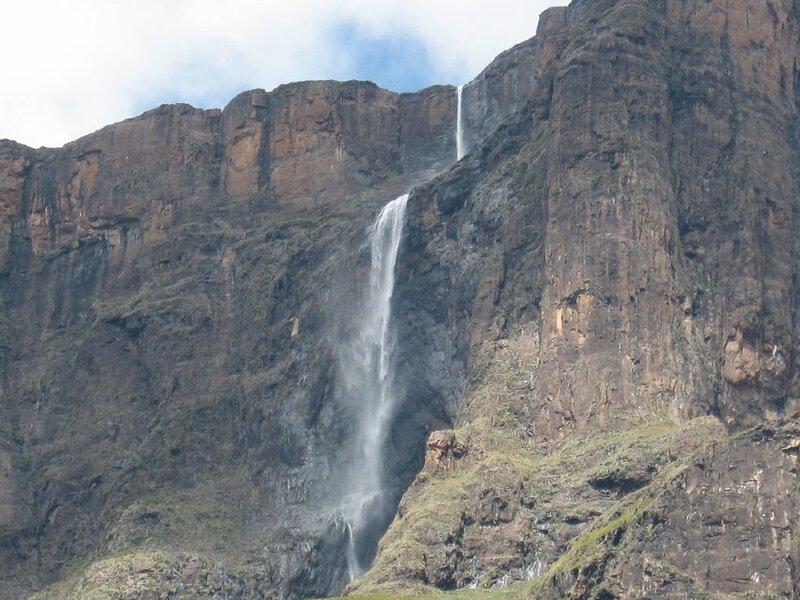 There are two trails to the Tugela Falls. The most spectacular trail is to the top of Mount-Aux-Sources, which starts at the Sentinel car park. The car park is approximately 90 minutes drive from Harrismith via the R712. (driving through Phuthaditjhaba on the R57). From the park it is a relatively easy climb to the top of the Amphitheatre, however it does take about 4.5 to 8 hours round trip depending on fitness level. 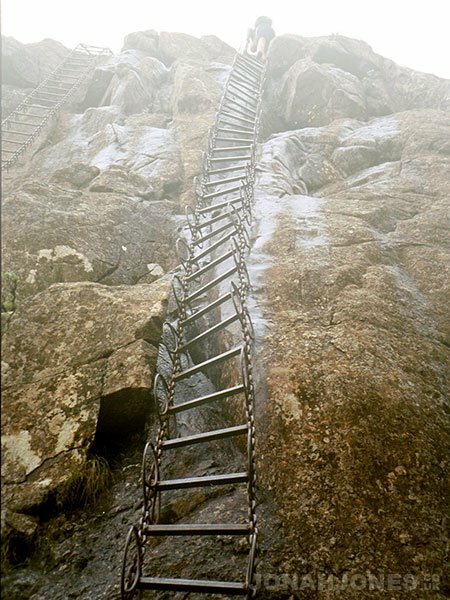 Access to the summit is via two chain ladders. This is the only day hiking trail which leads to the top of the Drakensberg escarpment. 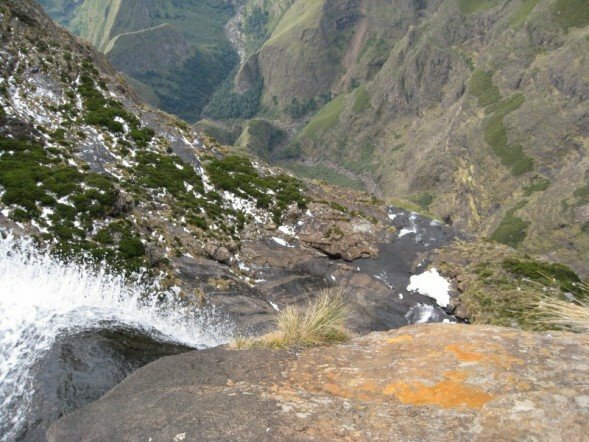 Another trail to the foot of the Tugela Falls starts at Royal Natal National Park. The easy 7 km (4.3 mi) gradient up the Tugela Gorge winds though indigenous forests. The last part of the hike to the Tugela Falls is a boulder hop. A little chain ladder leads over the final stretch for a view of the falls rushing down the amphitheater in a series of five cascades. There is an entrance fee to the Royal Natal National Park and a nominal fee to hike the mountain.